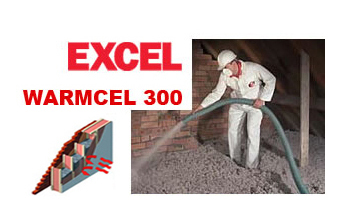 Excel’s Warmcel 300 Cellulose is the only insulation used in attic spaces that carries current IAB approval. Warmcell 300 attic insulation is pumped into position over the attic floor to the required depth to achieve or exceed current building regulations. Because the insulation is pumped through a hose attached to an advanced delivery system, access to restricted spaces, such as shallow eves, or even the attic access it’s self, are easily achieved.